As I write this, I’m sitting in a McDonalds about two minutes from my apartment in Sydney. It’s the only place I know of with free wi-fi. Hopefully we’ll have it at our place soon. The flight was good. It did not feel like I was on a plane for 20 hours. I slept most through most of the second flight – I don’t feel jet-lagged at all. The weather here is perfect – 70’s, sunny, a light breeze. I went on a run around Coogee Beach this morning, and it is picture-perfect. We have two balconies that overlook the beach – it almost feels like a hotel. I’ll post some photos once I get better internet access. – Overall, Sydney feels like a U.S. city. It hasn’t been much of a culture shock, other than the accents. – Everything is open. Many places don’t have doors. 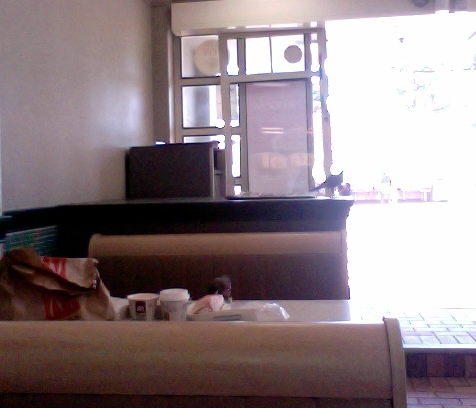 In fact, a bird just flew into McDonalds. – It hasn’t been hard adjusting to people driving on the left side of the road. It’s been much more difficult walking on the left. – There is some crazy wildlife. We have lots of different animals living in the trees in our yard with very unique calls. – We’re lucky to have so many eateries around us. Some of the food can be pricey, but we found a relatively inexpensive supermarket near our place.